The La Raza-backed Rubio-Schumer immigration bill would have granted amnesty to the illegal alien population and would have expanded immigration levels beyond all known historical precedent— issuing 33 million new immigrants on green cards in the span of a single decade, permanently transforming the U.S. electorate and economy. Every immigrant with a green card could in turn bring relatives to the United States, collect welfare, and eventually vote and thus cancel out conservative ballots. As many reports have indicated, in 2013 Rubio became the public face of the immigration agenda of Barack Obama, La Raza, and the Chamber of Commerce. Rubio was the “salesman” for the bill— it was Rubio’s job to sell the bill to conservative opinion makers, who had trusted him. 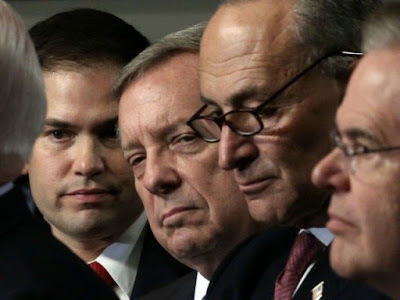 For instance, at the time Rubio pledged to Rush Limbaugh, “If there is not language in this bill that guarantees that nothing else will happen unless these enforcement mechanisms are in place, I won’t support it.” Even though, as Sen. Schumer explained, the bill would grant amnesty to the illegal population “on day one” before the border was secured, Rubio voted for the bill anyway. Rubio, however, voted against an amendment offered by his Republican colleague that would have added a visa tracking system to the Obama-backed immigration bill. As a result, Senator Rubio succeeded in passing through the Senate a bill that would have added four times more new foreign workers than the rejected 2007 McCain-Kennedy bill. As Senator Sen. Jeff Sessions (R-AL) said, Rubio has never changed his immigration positions on anything— nor has he ever asked for an apology or admitted that anything he ever said was wrong. Rubio has continued to pledge his support for all of the major policies outlined in the Gang of Eight bill: including green cards and thus citizenship and welfare for illegal aliens, expanded refugee resettlement, and he has introduced brand new legislation backed by his Silicon Valley supporters to massively increase the number of wage-cutting H-1bs. Rubio has also admitted that he would continue the President’s unconstitutional DACA amnesty. Schumer’s declaration seems to confirm the fears of Rush Limbaugh, Ann Coulter, Laura Ingraham, Daniel Horowitz and other prominent conservatives, who— following Rep. Paul Ryan (R-WI)’s election as House Speaker— warned that the group behind the 2013 amnesty push is getting back together to push amnesty in 2017. These conservatives argue that with Rubio in the White House, Paul Ryan in the Speakership, and Chuck Schumer as the Senate Minority Leader, it would be impossible to stop a mass immigration expansion bill. As CNN observed, Schumer has worked with both Paul Ryan and Marco Rubio on immigration. Schumer explained that, as Senate Minority leader, he would reach out and work with pro-amnesty Republicans. “I’m going to try to reach out to Republicans… I think I can work well, I’ve shown it, with the [John] McCains, the [Lindsey] Grahams, the [Lamar] Alexanders,” Schumer said. On Breitbart News Daily on SiriusXM radio, Sen. Jeff Sessions laid out a new litmus test that he says must apply to anyone running for the GOP nomination. Sessions explained that it goes without saying that a GOP nominee can’t have certain positions on certain issues. Sessions rattled off a few examples: “A Republican candidate for President cannot run in favor of Obamacare, can’t run in favor of more taxes, more spending and more debt.” Yet, while these topics are all a given point of agreement, they remain almost the exclusive focus of the GOP primary debate. Rubio cast the 60th deciding vote to fast-track TPP— removing the ability to amend the agreement, or apply either a 60-vote or 67-vote standard— and Rubio is the most aggressive proponent of expanding record immigration in the GOP field. According to Pew, by a nearly 5-to-1 margin, Republican voters believe that so-called free trade agreements like the TPP will slash wages rather than raise them. Only 11 percent of GOP voters say these trade agreements would increase wages. Similarly, more than nine in ten Republican voters would like to see future immigration levels cut.